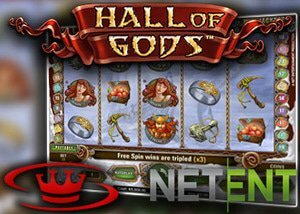 The Hall of Gods slot for mobile players is going live on the 16th of February in all NetEnt casinos. This iconic jackpot slot is now going to be available for all mobile and desktop users. February is shaping up to be an exciting month for NetEnt casinos with some very special releases on the cards. The big talking point for most fans is the release of the Hall of Gods mobile slot. This iconic slot is being optimised for mobile gaming and will hit casinos on the 16th of February and fans of Norse mythology who haven't played it are in for a treat. This game is one of the NetEnt progressive jackpot slots and it can make you rich in an instant. There are three progressive jackpots available and the "Mega" is usually hit at around the 4 to 6 million spot. This is exciting news for fans of the game and it means that with just one spin on your mobile you could change your life. Hall of Gods has been around for a while now and is a really popular choice among slots enthusiasts so it is great to see that it is being optimised for mobile gamers too. If you'd like to test out the new mobile Hall of Gods slot, we have a great exclusive no deposit bonus to share. This is a $21 no deposit bonus that you can use to play all the great slots at 777 Casino as well as the new Hall of Gods mobile slot. If you like what you find here you can claim their welcome bonus too. This is a first deposit bonus of 100% up to $200 when you use the bonus code WELCOME777. Players can also claim a special bonus offer on their first five deposits at the casino too which will give them 30% up to $100 on deposits 2 to 5. There are lots of ongoing promotions at the casino too with special free play offers, free spins, and more, so be sure to check it out if you are looking for a great NetEnt casino to play at in 2017. Also coming to NetEnt casinos in January and February are Wild Wild West: The Great Train Heist, Divine Fortune slot, and the Joker Pro slot. Wild Wild West releases on the 23rd of January and Divine Fortune is due for release at the end of January. Joker Pro slot releases on the 9th of February. You can try all of these new release games as well as Hall of Gods slot for mobile and desktop at any of our recommended NetEnt casinos. It looks like NetEnt is getting the year off to a great start and we're sure they will have plenty of other great releases to follow as the year continues. If you are a fan of NetEnt slots be sure to check out the great bonus offers that we have here on our site for all NetEnt casinos. Check out the preview for Hall of Gods Mobile in the video below.